When it comes to conveying visual information clearly, a line drawing is often the best choice. Of course, good informational line drawings require a specific set of skills. Aside from meticulous draftsmanship, you need subject matter expertise—you have to know exactly which aspects of what you are drawing are most important, and how to convey that importance to the reader. Years ago, I found a book in my boyhood public library, The LaGrange Public Library, that fascinated me: Things Maps Don't Tell Us: An Adventure Into Map Interpretation, by Armin K Lobeck. It was published in the year of my birth, 1956. This was decades before I managed to gin up any enthusiasm for geology (now a particular interest). But the book seemed to pull the curtain back on certain secrets of the physical world that no one had so clearly revealed before. And that revelation came visually. That that earnest subtitle ("adventure" is definitely overpromising) didn't put me off will tell you something about my more earnest younger self. Lobeck's method of explanation is both simple and subtle. He wants us to understand that the flow of rivers, the shape of islands, the location of cities, the routes of highways, and the shapes of lakes are caused by the underlying geology. So he classifies the patterns by their underlying causes. Peninsulas, for example, can be sand spits of various kinds, cuestas resulting from tilted rock layers, eroded deltas, or many other things. But on a typical map, all you see is the shape. He describes the underlying causes of specific coastlines, river patterns, lakes, and many other formations. The way he teaches you about these is by showing two facing pages on each two-page spread of the book. The left hand page shows what the landscape looks like as shown on some regular map, some showing an entire continent, some a much smaller area. He removes any extraneous features in his simplified sketch version. On the right hand side is a diagram of what causes led to those particular shapes, patterns of rivers, or whatever. For example, here is his explanation of two peninsulas in the Great Lakes: Door Peninsula in Wisconsin, and the Bruce Peninsula (called Saugeen Peninsula on the map). On the left hand map, they are, well, just peninsulas, land surround on three sides by water. 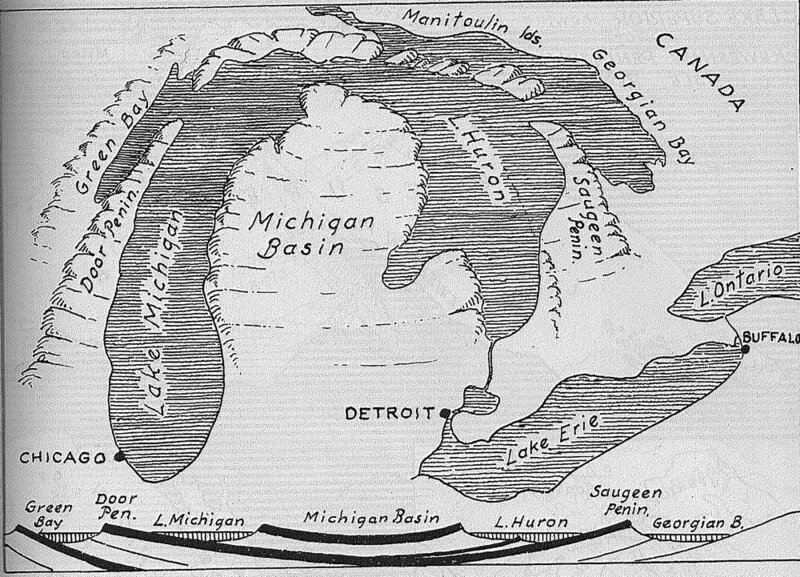 But the right hand map (and the crisply detailed explanation I have not included) shows how the downcurved layers of the Michigan Basin come up in curving ridges, ridges that, due to glaciation, now are surrounded by water. He points out the circular pattern of the formations around Lakes Huron and Michigan. Not just these two peninsulas, but islands, Green and Georgian Bays, and the shapes of the Great Lakes themselves. That's just a taste of a book that has 72 examples of this sort in total, some of them including multiple places in the world. It's really a nice way to get a knowledge of landforms, and it's something I often refer to when trying to figure out some fictional landscape. And you can see how Lobeck's eye and hand have made things clearer for us that anything else could. If you want another example of Lobeck's work (not from the book), here is his map of Kentucky. I could use maps of other complex areas, the Caucasus for example, to help me understand the history of the area. I have yet to find any.